So you’re probably wondering where the ‘magic’ comes from. It’s all about how this dish turns some pretty common ingredients into something truly delicious. All it takes is a little time in the oven. This is one of those dishes that’s best served at the table in the roasting pan so everyone can help themselves and pick at the crispy bits on the bottom of the pan. 2. Halve pumpkin crosswise then chop into wedges. 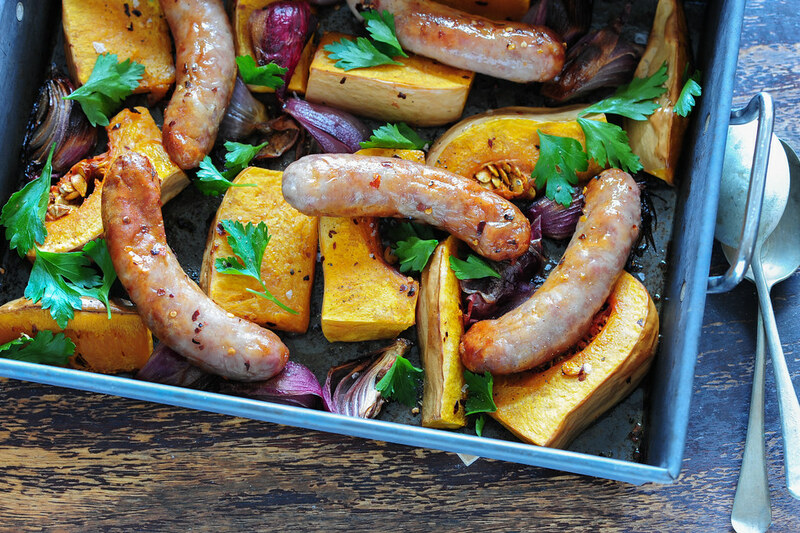 Place pumpkin, onion, chilli and sausages in a roasting dish. Drizzle generously with olive oil. 3. Roast for about an hour, stirring at the half way mark. It’s ready when everything is golden and tender. 4. Serve with parsley leaves sprinkled over the top. different vegetables – longer cooking time (45-60 minutes) – parsnips, potato, sweet potato, pumpkin, beets, carrots, celeriac (celery root), swede (rutabaga), turnips. different vegetables – medium cooking time (around 30 minutes) capsicum (bell peppers), zucchini, onions, brussels sprouts, fennel, cabbage, broccoli, broccolini, cauliflower. different vegetables – quick cooking time (around 15 minutes) asparagus, green beans, snow peas, bok choy. no sausages? – use chicken drumsticks or thighs instead. spanish – use fresh chorizo as your sausage and toss in a can of drained chickpeas instead of the pumpkin. vegan – replace sausages with field mushrooms. vegetarian – skip the sausages and serve the roast veg with a poached or fried egg on top. carb lovers / more substantial – add scrubbed halved potatoes with the butternut. OR serve with crusty bread + butter..
short on time – pan fry sausages and serve with hummus and a salad instead of butternut. more veg – serve with a green salad on the side. Pop in the oven (180C / 350F) with a cover on for 20 minutes or until warmed through. Then serve with the parsley. If frozen, allow to defrost in the fridge before heating in the oven. Do not try to go straight from freezer to oven because the outsides of the sausages will overcook before the insides have had a chance to defrost. Great as a meal on it’s own. Or you could serve a green salad on the side. Store in an airtight container without the parsley. Will keep in the fridge for 2 weeks or so. Wrap coriander leaves in paper towel and store in a plastic bag in the fridge for 2-3 weeks. Easy freeze meal? Can be frozen for up to 12 months. butternut pumpkin (squash) – will keep in the fridge for weeks. Best not to freeze. onions, chilli flakes – pantry. parsley – will keep for a few weeks in a plastic bag in the fridge. Can be frozen but will wilt when defrosted. burning – the heat is probably too high, or you haven’t been stirring often enough. If things aren’t cooked through yet, cover with foil for the remainder of the cooking time. too dry – drizzle over some extra virgin olive oil. Next time consider cooking less. too bland? – don’t forget to season. Salt, pepper and lemon juice are all your friends here. This has become my go to favourite. I have a very good butcher who makes good quality sausages and my husband loves baked vegetables. I definite winner that is so easy to put in the oven on a lazy Sunday afternoon. And there are so many options to vary the vegetables so we never get bored! What an easy dinner! I added zucchini, didn’t use chilli flakes, used fresh rosemary instead. My Dad would make a very similar version of this, but with apples and potatoes (sometimes sweet potatoes) baked with the sausage – the apples add a lovely sweetness. I’m looking forward to trying it with the squash. Love the idea of apples Jenn! We’re in the middle of a snowstorm and I just made this for supper with banger sausage, broccoli, turnips, and garlic. Big hit with me, my husband and the eight-year old (who was sad we weren’t grilling the sausages)! We squeezed a bit of lemon over the veg. Glad to have only one pan to clean. We’re having a heatwave here… so more in sausage grilling land. Yes you could cut the veg smaller or add the sausages later… I’d probably just add the sausages at the beginning and then check on them about half way and be prepared to remove them from the oven when they’re done… then add them back at the end to warm up.. this way it takes the guesswork out of figuring out when to add them. Made this last night with what i had in the fridge- bratwurst sausages, onion, cauliflower and thyme. Tossed spinach leaves through it just before serving and a squeeze of lemon juice. Just made this for dinner pre-night shift for my husband and I – was delicious and went down a treat! Nice and filling but without making you feel tired and bloated. Plus very easy to make! Glad you liked it Meriel! It’s a favourite in our house too. I hope the night shift was ok… I used to have to do it when we had a new product coming out in my last job and it was always tough for me! I tried this with my family and they loved it. my kids like different vegetables and this way I can mix it all in one oven pan. Then i just dish each one there favorites when it is ready. It can also really adapt to what we have in the house. Thanks! That one weekday supper sorted.